This software update provides the latest Android security patches on your device. Picture in Picture (PIP): A new split-screen window lets you use an app and watch a video at the same time. Autofill framework: With your permission, Autofill works together with Moto Key to avoid repeatedly entering the same information on a touchscreen keyboard. Securely stores your data. Smart text selection: When you select text, Android Oreo suggests relevant apps or intelligent actions. Select and double tap the correct portion of the text and automatically get names, addresses, phone numbers, web links and emails. Adaptive icons: Multi-shape app icons according to your system settings. Apps run faster and smoother: New optimization provides improved performance of apps and games. Bluetooth audio enhancements: High quality Bluetooth audio codecs make your music sound even better. Better management of cached data: Every app has cache data limit. As the system needs to free up memory, it automatically deletes cached data from apps exceeding their limit. Battery-saving background restrictions: Android Oreo improves battery and memory optimization. Built on Nougat's battery life improvements, it's a power saving feature in addition to "Doze," which limits how often apps in background check location, scans Wi-Fi networks or accesses data. Stability improvements: Bugs and improved device stability. 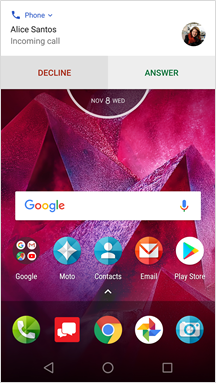 Notification badges / dots: Oreo now provides "Unread" badges on top of home screen icons. Tap and hold an icon to get notification of what's new, and clear them by swiping left. Notification channels: Now you have more control over notifications. Apps have named notification categories. You can choose to receive notifications about specific topics. Snooze notifications: You can "snooze" notifications instead of dismissing them. They'll pop back up at the same level of importance. Notification bar: App icons are listed in the bar in hierarchical and more organized ways. Themed Notifications based on music cover art: You can customize background and text themes are customized in Notifications list and Lockscreen. 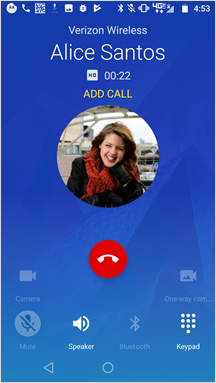 Incoming Call: New layout, with a smaller contact image. Unlocked Mode - DECLINE and ANSWER call icons are red and green. Active Call: Changes in the User Interface to improve usability. 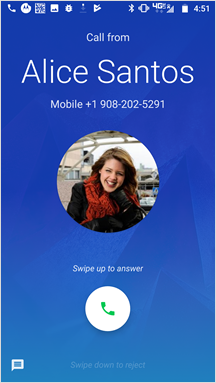 Rejecting Call: Answer calls by swiping up on the screen. Swiping down rejects the call (replaces the Answer and Ignore icons). Swiping up on the message icon (bottom left of the screen) opens a pop-up screen, letting you send a text message to the call originator. Select one of the canned text options or write your own to send a text message and reject the call.